SWOT analysis, method, or model is a way to analyze competitive position of your company. SWOT analysis uses so-called SWOT matrix to assess both internal and external aspects of doing your business. The SWOT framework is a tool for auditing an organization and its environment. SWOT is the first stage of planning and helps decision makers to focus on key issues. SWOT method is a key tool for company top officials to formulate strategic plans. Each letter in the word SWOT represents one strong word: S = strengths, W = weaknesses, O = opportunities, T = threats. 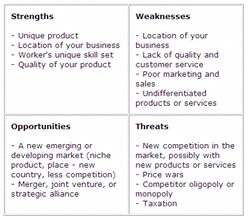 SWOT model analyzes factors that are internal to your business and also factors that affect your company from outside. Strengths and weaknesses in the SWOT matrix are internal factors. Opportunities and threats are external factors. SWOT can be used in conjunction with other tools for strategic planning, such as the Porter's Five-Forces analysis or the Balanced Scorecard framework. SWOT is a very popular tool in marketing because it is quick, easy, and intuitive. The concept of determining strengths, weaknesses, threats, and opportunities is the fundamental idea behind the SWOT model. To present the model in a more understandable way, scholars came up with so-called SWOT matrix. SWOT matrix is only a graphical representation of the SWOT framework. SWOT matrix makes understanding the model easier. Can you show SWOT analysis on an example? Opportunities and threats are external value creating (or destroying) factors a company cannot control but emerge from either the competitive dynamics of the industry or market or from demographic, economic, political, technical, social, legal, or cultural factors. Factors related to each aspect of the SWOT model depend very much of the nature of your business. SWOT for a manufacturing company will be different from a SWOT for an internet start-up. Is SWOT analysis a hard science? The answer is no. SWOT analysis can be very subjective. Someone can see a new firm coming into the market as a threat because it takes away your current customers. Someone else might see the same company as opportunity because that company might have innovative ideas which your business can explore, and your business might even benefit from possible takeover of that new competitor. What is the difference between SWOT and TOWS? TOWS analysis is very similar to the SWOT method. TOWS simply looks at the negative factors first in order to turn them into positive factors. How should I do the SWOT analysis? There is a number of simple rules that you can go by when creating a SWOT matrix in SWOT analysis. Be realistic: Make sure you assess your situation objectively. It is better to be more pessimistic about weaknesses and threats and lighter about strengths and opportunities. Today versus future: When doing the SWOT analysis, distinguish between today's state of your business and your expectation for the future. Mixing your expectation with the current state will result in skewed outcome. Simple: Keep your SWOT matrix short and simple. Avoid complexity and over analysis. If you want to include many points to each quadrant of the SWOT matrix, it is a good idea to weight them. What is the next step in SWOT analysis? We mentioned that the SWOT analysis is very subjective. One way to bring numbers into the SWOT analysis and make it more useful is to weight individual items. Give a weight to every item in the SWOT matrix and then add them together. Each quadrant in the SWOT matrix will result in some number which as a whole will give you a better picture where your business is relative to other quadrants. This leads us to two models called the IFE matrix and EFE matrix that are rooted in the SWOT analysis. There are three other models related to this called the BCG matrix model, SPACE matrix model, and QSPM model which you can find here: BCG matrix, SPACE matrix model, QSPM model. In case you have any questions about SWOT analysis, you are welcome to ask them at our management discussion forum.